TOA Spa started by operating several successful Massage, Acupuncture, and Day Spa Establishments in Southern California . Opening and operating these establishments proved to be difficult, time consuming, and expensive. We spent a lot of time and energy locating suppliers of all the equipment we needed, then find more suppliers for all of the oils, lotions, sheets, disposables, and other supplies. We needed to shop many suppliers to get the best deal possible, which was still expensive. Many of our preferred suppliers wouldn't sell to us because we were buying in small volumes and didn't qualify for a wholesalers pricing structure. Our friends, doing the same businesses, experienced the same difficulties, so a decision was made to start a small buying co-operatively to get better pricing and share the discounts afforded in these volume purchases. In general it's "Business 101" buy enough to equipment for 1 store and receive no discount, co-op and buy enough to equip 10 stores and receive a small discount, equip 20 store = better discount, and so-on.The other issues that arose were inconsistencies of quality and the lack of input to the manufacturers regarding the desired product features. Soon we started buying additional supplies every time we would make a co-op purchase and storing them for future use. This gave us a better pricing advantage and a more consistent stock of supplies. We didn't have to wait until the others in the co-op were ready to buy. When we ran out of garage space, we rented a 1,000 square foot warehouse. Word got out that we always had extra equipment and supplies on hand and TOA SPA EQUIPMENT, Inc., also known as Touch of Asia Spa Equipment, Inc, came into being. By April of that same year we moved into a 6,500 square foot warehouse and were terrified by all of the extra space. We thought maybe we were spending too much on rent and had taken on too much financial liability. 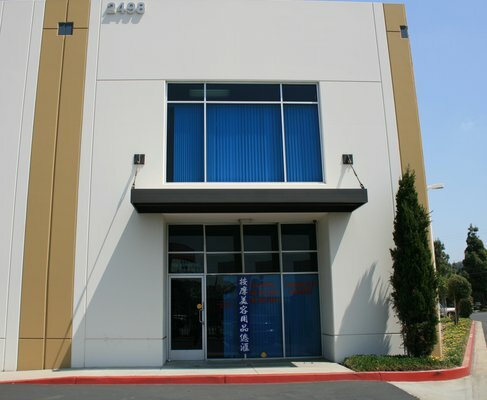 Then in July we rented a second 6,500 square foot warehouse next door and have since added second floors to each bringing us up to over 27,000 square feet at our primary location, and other warehouses in the Los Angeles area to store additional products have been added. We now have enough "clout" with the manufacturers to influence design and quality. Much of the product-line is "private labeled" which means that it's made to our specifications of quality and / or by one of our companies that we control. We remain true to the original concept that when you purchase from us, you become a member of our cooperative and share the discounts along with the larger volume purchasers, much like Sam's or Costco, however we don't charge for membership and don't require you to purchase large volumes to get the savings. Come visit our showroom to view our inventory and ask about Volume Purchase Discounts if you're looking to purchase a container load of a specific product. We are currently evaluating applications for additional distributorships of our products, or franchising showrooms using our advertising program. If you're interested in becoming a distributor, please contact us. We will arrange drop shipments or discuss other shipping options. Let us be your one-stop shopping source and provide all of your business needs.